The Legends of New Pulp Fiction is released! 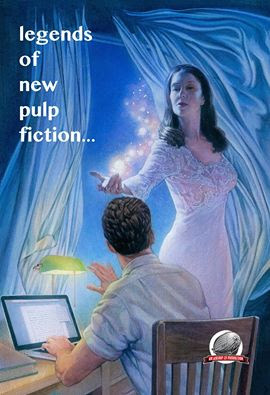 I am pleased to announce that my short story, "The Aquarium," is available in the newest collection from Airship 27 Productions: The Legends of New Pulp Fiction (http://www.amazon.com/Legends-New-Pulp-Fiction-Fortier/dp/0692601139/ref=asap_bc?ie=UTF8) This is not my usual horror yarn, though parts of the story are horrific, but a crime tale featuring "Doc" Salvatore Scaldero, former enforcer for an outlaw motorcycle club. This book is a fundraiser for Tommy Hancock, a writer/publisher/editor in the New Pulp movement who is suffering from congestive heart failure. Ron Fotier and Jaime Ramos came up with the idea to publish a book to help offset Tommy's medical costs. The result is a tome weighing in at almost 4 pounds with 60+ authors and 40 artists contributing to the piece. When you buy your copy of the book, you'll get 62 pulse pounding pulpish tales and Tommy gets much-needed funds. She stood, naked, in the hallway. In this light, the blood that dripped from her fingers and pooled by her bare foot had a dark brown color. When did she lose her shoes? She wondered. Her chest rose and fell rapidly, as if she had been in a fight for her life. She teetered, and put a hand on the wall to support herself. Later, one of the local tabloids would use a photograph of that almost perfect, albeit blood-stained, handprint in a series of articles outlining the horrific events leading up to this day. For now, though, it was nothing more than an impression of a girl trying not to lose her balance.